Chakra: Area between the Second/Sacral Chakra and Third/Solar Plexus. Relates to the location of the incarnational star or true aura, just above the navel and a little way inside. Has a significant relationship with the Sixth chakra, the royal blue. Represents the connection with our incarnational star, our innate wisdom, and finding abundance and the possibility for deep joy within ourselves. 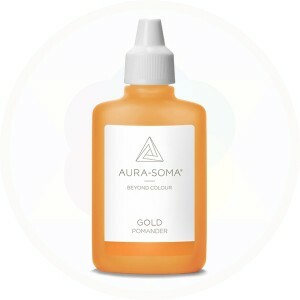 Gold may bring a deep level of nourishment and self acceptance, helping to reconnect our inner truths with ancient wisdoms. Supports the release of patterns of the past, which may enable us to understand what lies behind our perceptions of life. As the solar plexus relaxes, we may connect with our "True Aura" to receive information about our reason and purpose for being. In a group environment, may help to bring a sense of ease and the possibility that the whole group may become more clear and purposeful. Gold helps us to connect with our instincts and innate wisdom. It can be helpful in allaying irrataional fears and phobias, and support self-confidence. Gold facilitates the breaking of habitual and emotional patterns, and addressing the fears that lie behind them. Gold connects us to understanding the value and meaning of our life.